This is a birthday gift; an odd birthday gift that will only mean something to one person. This was one of the favorite shops of two little girls back in the early 1960s. The other was Shirokiya. 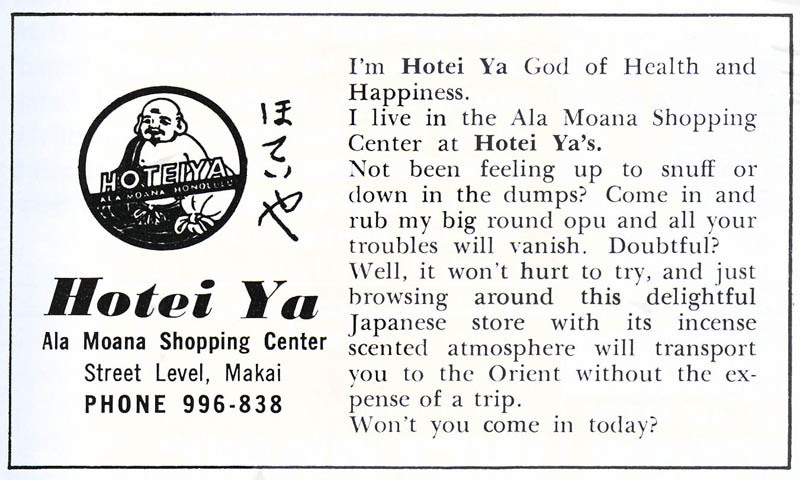 Both stores were in the Ala Moana Shopping Center. Shirokiya still exists, though it's nothing like the original store. Alas, Hotei Ya is long gone. Good times! Good Times! Happy Birthday my friend. I remember Hotei Ya. Thanks for sharing the business card. The store was charming and so was this card. Mahalo.